Copyright 2015 The Company of Biologists-this article is Licenced under the terms of the Creative Commons Attribution Unported license (http://creativecommons.org/licenses/by/3.0) (CC By 3.0). There is a desperate need for targeted therapeutic interventions that slow the progression of amyotrophic lateral sclerosis (ALS). ALS is a disorder with heterogeneous onset, which then leads to common final pathways involving multiple neuronal compartments that span both the central and peripheral nervous system. It is believed that excitotoxic mechanisms might play an important role in motor neuron death in ALS. However, little is known about the mechanisms by which excitotoxicity might lead to the neuromuscular junction degeneration that characterizes ALS, or about the site at which this excitotoxic cascade is initiated. 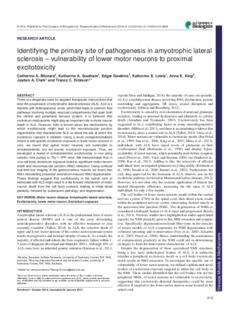 Using a novel compartmentalised model of site-specific excitotoxin exposure in lower motor neurons in vitro, we found that spinal motor neurons are vulnerable to somatodendritic, but not axonal, excitotoxin exposure. Thus, we developed a model of somatodendritic excitotoxicity in vivo using osmotic mini pumps in Thy-1-YFP mice. We demonstrated that in vivo cell body excitotoxin exposure leads to significant motor neuron death and neuromuscular junction (NMJ) retraction. Using confocal real-time live imaging of the gastrocnemius muscle, we found that NMJ remodelling preceded excitotoxin-induced NMJ degeneration. These findings suggest that excitotoxicity in the spinal cord of individuals with ALS might result in a die-forward mechanism of motor neuron death from the cell body outward, leading to initial distal plasticity, followed by subsequent pathology and degeneration.